Marie Van Marcke de Lummen established herself as a popular female artist in an art world dominated by men. 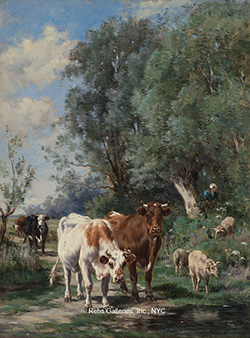 Her work showed an affinity with the Barbizon School and an interest in increasing the popularity of the depiction of animals, inspired by the work of her father under the tutelage of Constant Troyon. Marie was born Marie Van Marcke de Lummen on April 19th, 1856 in Sèvres, a town which has a long and illustrious history as a center for the production of fine porcelain. Her father, Émile Van Marcke de Lummen, was a porcelain painter at the factory in Sèvres, where Constant Troyon – who would become part of the Barbizon school and who would popularize depictions of animals – also worked as a decorator. The two met at the porcelain factory but Émile began studying under Constant as his pupil and went on to establish his artistic career by exhibiting at several Salon exhibitions. Marie’s mother, Victorine Robert, also had strong artistic ties, as she was the daughter of Louis Robert, one of the best painters at the porcelain factory at Sèvres. 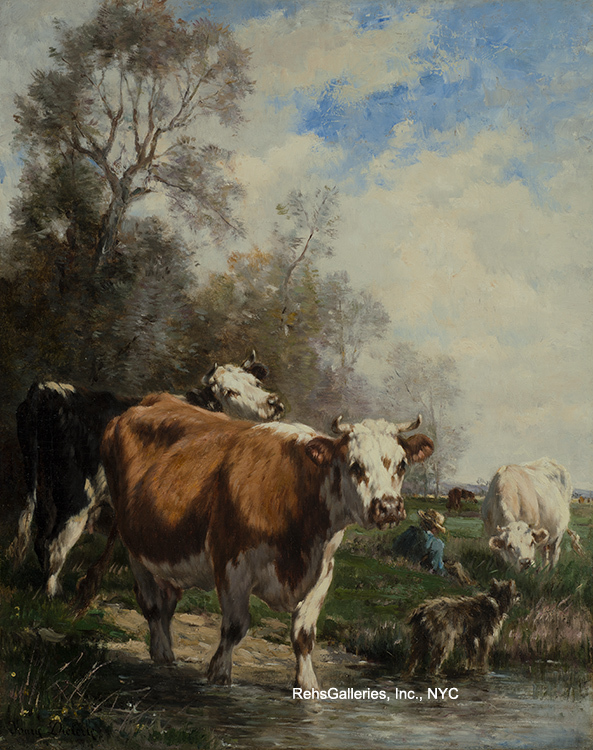 She pursues and radicalizes a certain idea of the landscape painted after nature and constructed an abundant œuvre around two recurring themes: cows and water…By these subjects of predilection, the œuvre of Marie Diéterle can be placed in relation to that of Rosa Bonheur. The themes are similar, but are different in the same way that Realism is different from Naturalism. She showed an interest in landscapes inspired by several regions of France, such as Normandy – especially Picardie and the Somme regions – as well as Brittany, the banks of the Seine, the Risle, and the Bresel. Her integration of cows into landscapes recalls the work of the Bonheur family; another family of artists interested in the theme of animals in a landscape. In 1875 Marie married a young man by the name of Charles Diéterle, also an artist, and who came from a family of painters. His father, Jules Diéterle, worked with Marie’s father Émile at the porcelain factory and was also an established artist himself, concentrating on both decorative paintings and landscapes. He too was involved with Constant Troyon, showing that each of the families were linked with the tradition of landscape and animalier painting. Charles’ style differed from both his father’s and Marie’s in that he worked most consistently in portraiture a nd did not find inspiratio n in nature to the level that Marie did. The family often stayed at the family villa in Criquebeuf in the house called “Les Ambrettes”. Thus, Marie had a network of artists surrounding her who encouraged her to further pursue an artistic career. Her husband stopped exhibiting in 1889 to allow Marie to continue her career, and giving himself more time to help raise their three children, Anne, Jean, and Marthe. She also participated at the Expositions Universelles of 1889 and 1900, receiving bronze medals at both expositions. By the end of her career she had become a member of the Société des Artistes Français and was “hors concours” which meant that her works were automatically accepted to the Salon, without having to be submitted for approval by the jury. In choosing the themes of landscape and animal painting, Marie was continuing a tradition that had begun in the early decades of the 1800s with the rejection of artistic stereotypes as set forth by the Salon system. She “…portrays a world devoid of all political and moral preoccupation…” (Desjardin-Menegalli, pg. 85) While the styles began to change during the latter half of the nineteenth century, Marie showed her allegiance to this type of plein-air painting based on views of the natural world as influenced by the work of her early career. The information provided in this biography has been drawn from the 1999 exhibition catalog Les Diéterles: une famille d’artistes, by Marie-Helene Desjardin-Menegalli, Catherine Join-Diéterle, and Florence Levert, based on the only exhibition held on the Diéterles, in Fécamp, France, at the Musée des Terre-Neuvas.